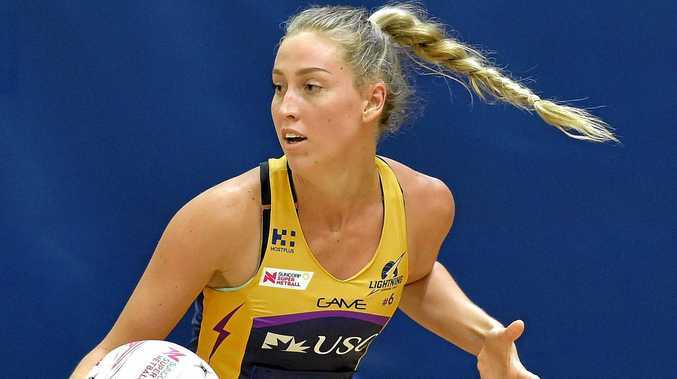 NETBALL: Sunshine Coast Lightning's new-look squad has thrived in their first competitive outings and it has Cara Koenen excited for what the club can achieve in the season ahead. The Lightning took on Collingwood Magpies in two practice matches over the weekend in Tasmania with the Coast outfit charging to victory in both. They defeated Magpies in a tight 53-54 thriller on Friday night before capping off the trip in dominant fashion with a 65-57 win on Saturday. Koenen said plenty of combinations were trialled with newcomers including Phumza Maweni, Peace Proscovia and Annika Lee-jones experiencing their first real game scenario in Lightning colours. "We've got a lot of new faces around camp so it's good to be able to get out in practice matches and try a few weird and wonderful things and see how they work out,” Koenen said. "It was an amazing starting point for us and pretty exciting coming away from the games this weekend just seeing where we can go with the new group of girls. She said the side would return to training armed with plenty of feedback and new goals to chase in order to fine-tune skills. "We will definitely go back to the drawing board and the coaches have given us a lot of feedback over the weekend so it'll be good to kind of have a chat about that in our little unit and as a team,” she said. Amongst all that was garnered from the two matches, Koenen had been particularly buoyed by how well the side gelled on court. "One of most positive things to take from it was the feel in team,” she said. It was the first time the Lightning had taken on former talents Geva Mentor and Kelsey Browne since they departed the club. "It was smiles beforehand but as soon as we hit the court we were down to business as usual,” Koenen said.